Bilat is a very simple software utility to rapidly generate bilateral audio from any sound source eg an audio file or an audio CD. Bilat is free for 5 days - after that you will need to purchase EMDR Pro to generate bilateral audio including beep sounds (Bilat is free for EMDR Pro users) or you may purchase a stand-alone licence if you wish. Bilateral audio simply means audio that pans from the left to the right speakers and back again. Just select a sound file by clicking on the "Add" button, then click on the "Auto pan" checkbox and decrease the rate of bilateral panning using the slider if the panning rate is too fast for you. You can play more or less all sound files / types including audio on a CD. (If you are a registered EMDR Pro user the default location for audio / video files will be set automatically to your shared library). You can bilaterally pan sound from video files and there is simple visual tracking via the slider bar at the top of the window. This means you can see the panning as it happens. All sounds loop to infinity. The tracking / panning speed is limited to about 60% of maximum until EMDR Pro is installed and registered. Panning ranges from 100% left to 100% right in all versions. Bilat can be used as part of the process for treatment of trauma / PTSD, the treatment of panic attacks / agoraphobia, the treatment of phobias and fears, the ongoing management of stress and anxiety and the treatment of addictions and habits. 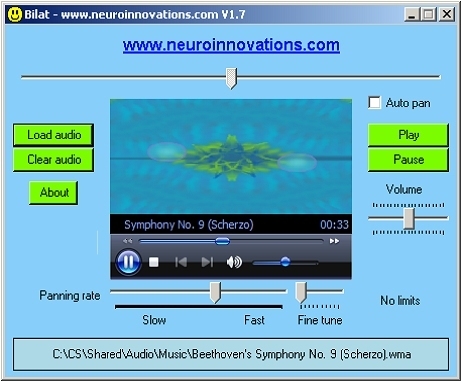 Windows media player may be required so Bilat can make use of the Codecs that are installed at the same time. How much does it cost? How do I get it?